In the original, Max is transformed from start to end into a blockbuster hero and saviour. Several issues and secondary plots weaken the cyberpunk aspect and the "fighting for your life" attitude. In this version, Max only wants to survive and save his life at all costs. He was the direct cause of all events and tries to fix them. Elysium is one of my favorite films, it's full of wonderful cyberpunk production design, great acting, action packed sequences, great characters and memorable punch lines. But I wanted to make the movie address Max's point of view in a more brutal, fast, raw and direct way. In other words, a more cyberpunk style movie! Big kudo to TM2YC for review, feedbacks, technical support, advise and much more. - Finally Spider wants to gain control over Elysium just like Kruger ? - Cut Frey has a young daughter, Matilda was ordered to leave her daughter home, as the doctors weren't able to give her treatments. - Trim Carlyle works up a new computer protocol called "Sabre Cerebral Defense"
- Kruger first apparition with "Activate Kruger"
- Cut She asks Max to find a way to get Matilda to Elysium, so she can be cured. - Create a new end with music continuity and shuttles land of from the cut illegal emigration operation. Panzerkut made a good, streamlined actioner. Pleasure to watch. The stuff that made me give up halfway through watching the original is now gone. This is a great little edit that removes the political side story and some other little moments of forced emotion. This is a tighter packed rollercoaster and for me personally makes this an enjoyable Cyberpunk story very much in vein to various post apocalyptic anime from the 1990's. The only downside is that the ending feels a little abrupt and inconclusive, but there's no real way to get around the hollywood ending otherwise that was originally completely stupid. The theatrical cut of Elysium suffers not only as a one-man army, CGI laden action movie, but also as a political allegory. The former is problematic because the main antagonist of the movie is a hired hand, with no direct tie to the hero or represent any thematic obstacle. The latter fails due to inserting technology (a miracle healing machine) into the movie without realizing how it undercuts its allegorical message. In the end, the movie is neither smart enough for a sophisticated audience nor dumb enough for an unsophisticated one. Panzerkut has set out to fanedit this movie to remove its more troublesome allegorical themes to make something that is "more brutal, fast, raw and direct." It removes the sentimentality of the relationship between Frey and Max, the coup with Delcourt on Elysium and the more blatant immigration overtones. However, perhaps by accident, Panzerkut's creation becomes an action movie without explicit themes, but implicit ones. This makes the film seem like it has bigger ideas than it has, allowing the viewer to speculate, and perhaps project, their own interpretation into the movie. For myself, I found a completely different allegorical message of the original's intent. This was a very pleasant surprise and, judging by the notes here written by Panzerkut, my take on his edit was likely a surprise to him as well. I'll refrain from spoilers except to say I think this is a strong and interesting edit worth looking into. A detailed breakdown of my thoughts on this edit will eventually be posted on my podcast - www.featurethispodcast.com. A/V Quality - Very sharp. My VLC player skipped at one point, but I was unsure whether this was player related or tied to the source material. Otherwise, this is a nice, clean, high-bit rate file. Visual Editing - Nothing stood out as too problematic. Scenes cut short or omitted altogether are not noticed - except perhaps narratively. I did notice a tiny moment in the third act of a removal of a shot which made for a slightly awkward moment in editing in which the camera goes from a close up on Matt Damon to another close up of Matt Damon. Again, nothing really stood out at all here. Audio Editing - In one or two scenes, it becomes noticeable that something is missing due to how the music score swells and descends (before the attack on Carlyle's ship for example). These edits are very few and far between, but are noticeable to a sharp eye (or is it ear?) for this kind of stuff. There are no noticeable pops, digitizations or volume issues. Narrative - The removal of nearly a third of the movie's run time is necessarily going to create gaps in character's relationships and motivations. However, there are no obvious plot holes and the edit covers its bases where it can in some creative ways. I would argue that some of the edit's narrative shortcomings actually improve the film because it opens the door to interpretation. However, I am willing to admit that to the degree that I think this is a good thing could be entirely personal. Enjoyment - I had a great time watching this edit and reinterpreting its meaning along the way as it unfolded. I will definitely be returning to this version, not only for myself but to share with other people in order to foster some discussions along the lines discussed above. This was a great edit. 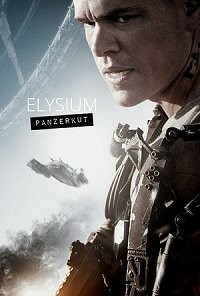 I always felt Elysium would work better as more post-disaster sci-fi instead of a political allegory. I really wish the opening text was changed. It makes more sense to be so far in the future that no one knows what year it is and no one can replicate advanced technology. People live and die controlled by automated systems who's original creators are all dead, much like Battle Angel Alita. The ending still feels a little abrupt but not sure if it is fixable; taking out flashbacks and savior robots going to earth was a good change.